But he sure seemed a big hit on the Haley Center concourse. Got to meet him during all of that-I think my right ear and sideburn may even be in the first picture. Most vivid memory was how huge his hand was when he shook. Would have hated to get hit with it. The wavy haired guy at he podium is Furman Bisher sports ed of the AJC. 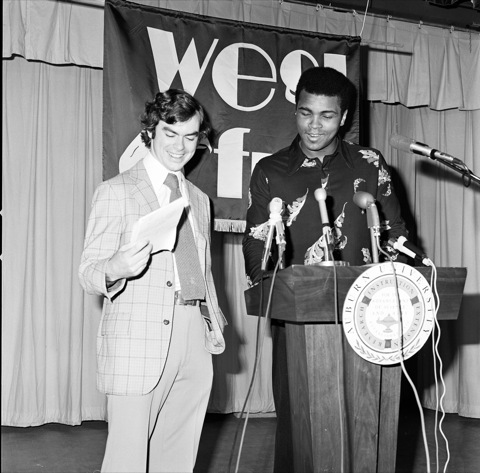 I recall he peppered Ali pretty good with draft questions. Funny thing Ali was kind of shy surrounded by all the equally shy white college kids. Thom Gossom and few of the black football players showed up. (there were probably less than 5 blacks on the team at the time) and one of the yelled “Hey Champ” to him and he started in to the “act.”. Even did the “Ali Shuffle” and pretended to box a friend of mine raining fake punches all around his chin. Almost peed in his pant. Little known but also cool, Rod Serling of Twight Zone fame came for a private seminar for us communications major. Very interesting. 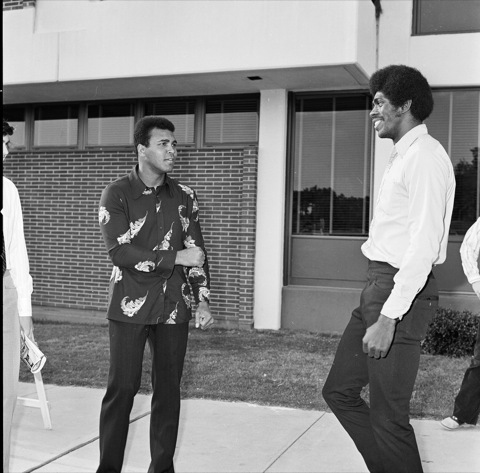 Having Muhammad Ali at Auburn in 1974 was a real coup. 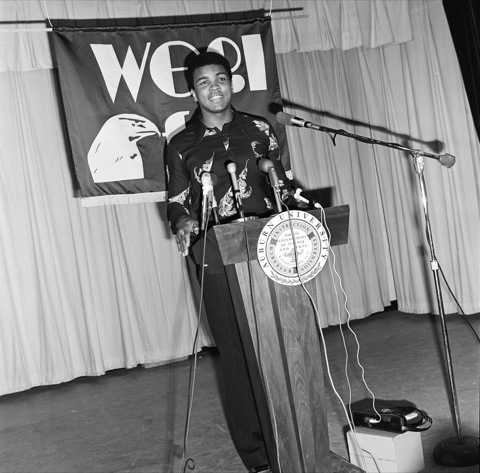 This preceded his best days as a Boxer but was one of his first appearances after taking a forced sabbatical for his stance as a Concientious Objector to the Vietnam War. 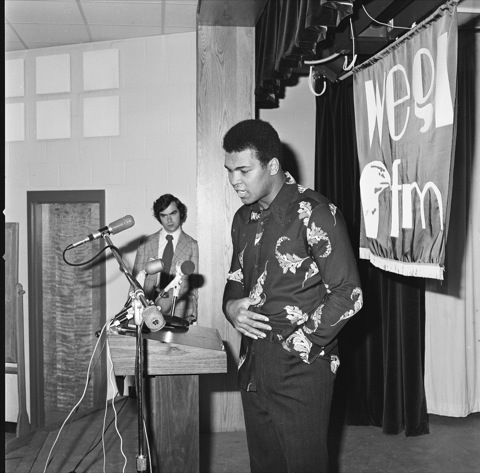 He was an inspired choice by the leader of the Horizons Program, the late Jimmy Tisdale, who had the equally inspired idea of having the best known Sports Writer in the South, Firman Bisher, introduce Ali. 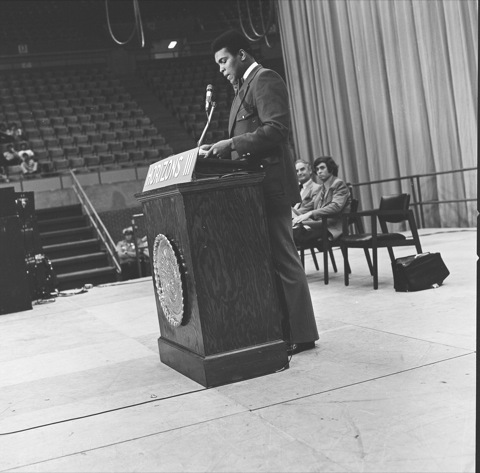 Most of us Sports fans anticipated stories of Boxing or of Politics, but instead, Ali delivered a Sermon entitled “The Intoxication of Life”, perhaps a message to us students and perhaps a result of his conversion to the Muslim religion. 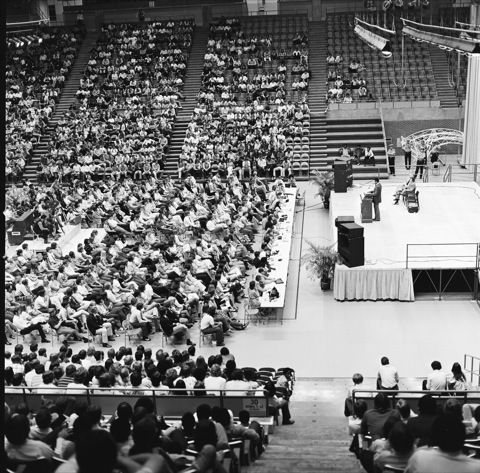 After about 45 minutes of that message, he turned to Boxing, to the delight of the audience. Furman Bisher, whom I’ve come to know well, still considers the Ali Speech one of the most bizarre he has ever heard. Tisdale hosted Ali at a Lunch held at the Lambda Chi Fraternity House (Ali had fish, others had chicken!) and Ali truly entertained the troops at that stop and many others. He was quick, witty, and funny. 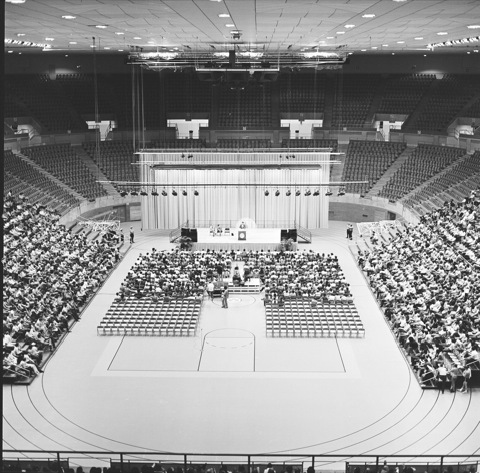 The audience at the Coliseum was close to 4500 attendees, the largest of the typical Horizon events which were intended to be small intimate settings and free to students. 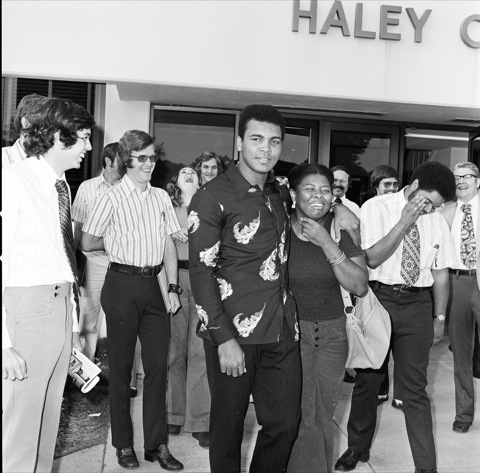 It was a special day and Auburn was able to see Ali at the early part of a legendary career. The Champ WAS here?! The Champ IS here! 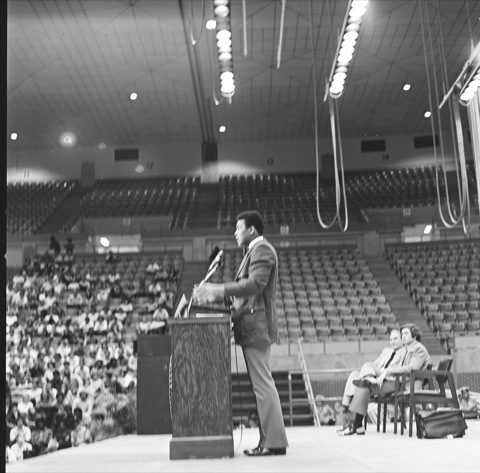 My twin brother John and I were fortunate to be in the audience at Auburn University when Muhammad Ali visited the campus in the mid-’70’s. The Champ was amazingly electric and spoke about the “Intoxication of Life” in spite of having a recently broken jaw courtesy of Ken Norton. 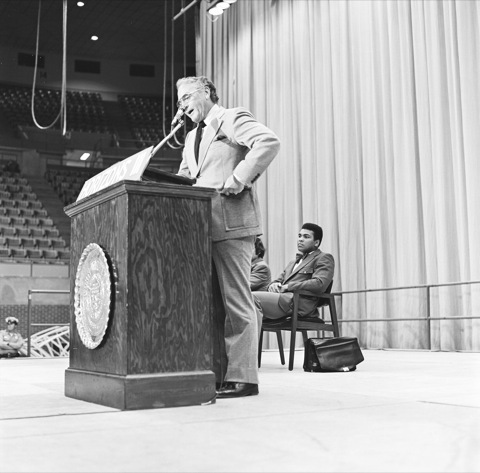 All of us as students were in awe of the bigger than life personality and reacted enthusiastically when Ali took his jacket off as he approached the podium and pointedly instructed the Birmingham News Sports Writer sitting on-stage to hold it for him. Each student bold enough to ask a question soon learned that the best way to address the speaker was to preface the question by referring to him as “Champ”. 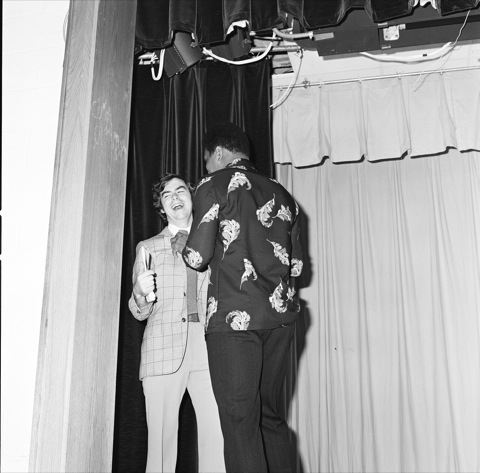 Ali was physically much larger than I had expected and had the personality that made him appear even bigger. I saw him briefly at the Cincinnati Airport many years later as I changed planes on a business trip. He was dealing with Parkinson’s disease even then and was not the imposing physical figure I had remembered at Auburn, but the man who had captured our imaginations so many years ago and who had done so much to positively transform America was no less an incredibly powerful presence. 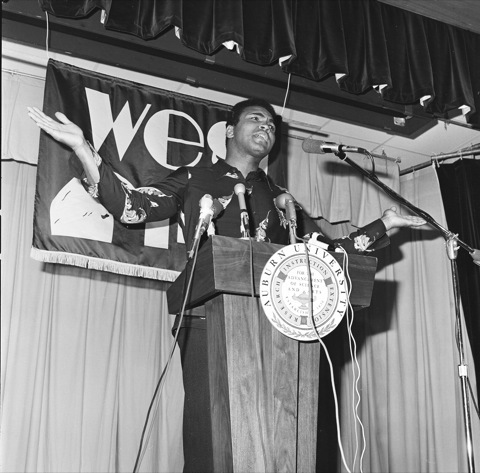 In my opinion, Muhammad Ali deserves to be considered as one of the truly trans-formative and positive figures in our country over the past sixty years. When you hear the word “Champ” and you’re over the age of fifty, who else comes to mind other than Muhammad Ali? After the lecture, we (Horizons IV) organized a reception in Dean Cater’s living room. He invited me and another girl to join him on the couch as he chatted with the group. I can’t remember her name. The two of us sat next to him on a couch for three and had a grand old time! He held court for about 30 minutes, then as we were leaving, I asked him to put a right hook on me, He responded, “I don’t hit ladies”…I coerced him to do a slow motion right hook on me…wish I had THAT photo. Larry Parker, did you get one?